4.4 out of 5 based on 157 bloggers and 49 commenters. 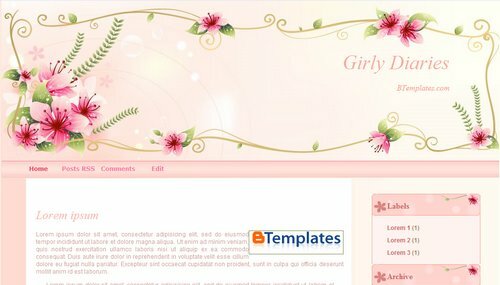 Girly Diaries is a free blogger template adapted from WordPress with 2 columns, right sidebar, fresh look, rounded corners, girly looking and floral motifs. Why cannot change the text size, color and some HTML? Is that locked? How can I unlock it and make some changes? You can change that in the HTML edition (you must edit properties in CSS). I can change the text color and date size now, but how can I change the date header at the top of the Post header? This template is very good, I love it, but just don’t like the position of the date. But am unable to edit the properties. Like changing the colors or fonts. Could anyone please help me with that? Beautiful template, thank you. I just used it for my blog. Would be great, though, if it comes with instructions on how to change fonts, colors, text size, etc. Someone has this problem? Knows how to resolve it? Great Blogger Templatel found after a long time of my searches of making a websites for teen girls or lovers with nichie themes…. Someone can explain me how could download this template and put it in my page? I’m new and I don’t have any idea! please step by step! thank you! i saw from the HTML code there is a pic for search column, how do i do the search column? which gadget should i add in order for the search column to appear in my blog? Why isn’t my profile picture, folowers and my “about me ” showing? I have this template, all modified to suit my needs. It’s awesome, I change for no other. Can anyone tell me how to delete the tabs at the top. RSS Comment and etc section.???? I am unable to change the text color for the blog title and blog posts. Could anyone please help me with that? Thank you for the great template! But i think i have the common problem as well, which is changing the text color, font size. I know it has to be change in HTML but i have no idea how to do it at all, can anyone help me? Besides, can i edit the row on “Home, Posts RSS, Comments..”? Thanks..
Ok I converted it, so it works now. But how to change the color and the size of fonts? I noticed that you mentioned changing the CSS thing. Where is it? How can I put the link to my profile? Muy linda template; sólo que en un monitor 16:9 con resolución de 1920 x 1080 los botones del encabezado se desplazan hacia la izquierda saliendose del diseño. oi e adorei esse template e coloquei no meu bog. Very nice! Used it for my blog! Thank you! This is so cute. But how exactly do we change the color and size for the actual blog posting? The HTML just list numbers and it’s hard to tell exactly where the font name and size is. Thanks, really cute. I love this template, but I’ve had people tell me they can’t make a comment. They get the word verification, but they can’t scroll down to put the verification in. Is there a way to get ride of this or fix it? may i know why i cant get the code? i already download but i still cant get the code. This is such a beautiful template. Big pat on the back to you for a job well done. Thank you so much for sharing your wonderful template. why there are no “newer post” and “older post” at the bottom of the page? @Hatikristal: I’ve already checked the CSS of this template, and I think the navigation links should work fine. If you go to Settings/Formatting, Show at most X posts on the mainpage, and you set that number to 7, you must have al least 8 posts published. Love this template thanks for creating! however i can’t seem to get rid of the links on the template “home” “post rss” “comments” “edit” how do i get rid of that bar?? sooooooooooooooooooooo beautiful , again thanks for creating n share to us. It doesn’t work! I went to EDIT HTML, copy and pasted the xml file and when I wanted to save, it gave this error. I tried to do it with another browser and it still gave me this! * Provide the following error code. Love the template, but the post font color is too pale to be easily read. I’ve tried adjusting the HTML but am not skilled enough apparantly to succeed. Can anyone suggest anything?